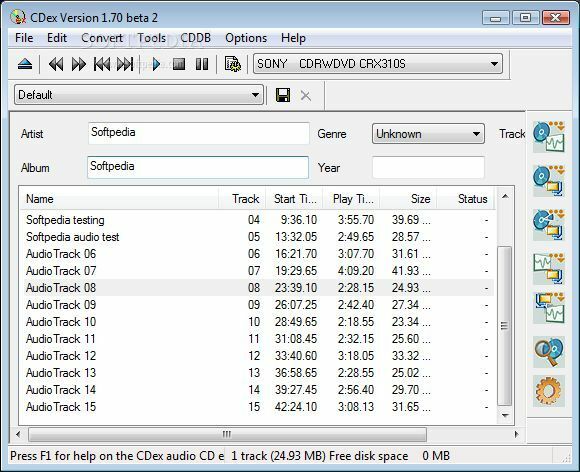 I've been using CDex since I came across it 3 years ago, and it's a great and complete piece of MP3 software. Easy to use, great features, yet a very simple (could be flashier though) interface. I don't know about this build yet, but former version worked perfectly with CD's of DVD audio streams. i have been using this for about 5-6 yrs now, and this even works on newer cds, and scratched ones also. It is so simple that even I can use it. I have been using this software sence ver.34 and have seen it progresed to it present it simple to use and can change from mp3 to wav or back cda to mp3 & bck no problem rip's in a snap and I mean at 320 that's I ever used for foster real faster bd faster ahead nero mp3 drop title's of the net like the rest, the only thing is that it does make a large like of clasification that I do not use but it great if clasify your music by tipes insted of artist, it probide suport for different tipe of audio modes justifications, simple to config try it great I have installed in friend's pc and they all love it they request it every time I config there pc or upgraded there unit's, it is small quick & free work great. I really like using this encoder and ripper for all my MP3 audio needs. It has a very good interface and has the best results when using the LAME encoder. At first, I had only used this product to work on the DivX movies, and have now discovered that it is also the replacement for Music Match Jukebox or any other program that makes MP3s. Thank the team who made this program! !